Roanoke - A Star City! 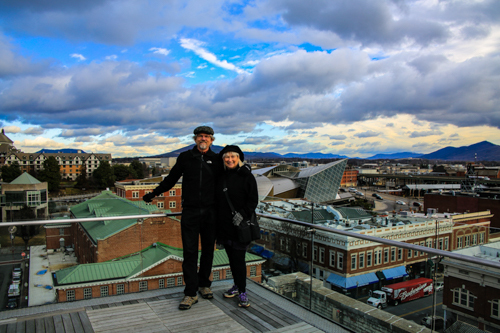 In our opinion Roanoke VA is the best "big" city that has the southern charm of a small town, and lucky for us just happens to be right here in the heart of the Blue Ridge Mountains. It is known for its neon Roanoke Star that towers over the city from the top of Mill Mountain. However, what attracted us was not only its railroad history but its connection with the railroad that remains today. After the Civil War Roanoke, first known as Big Lick, became the intersection for the Shenandoah Valley Railroad and the Norfolk & Western (formerly the Virginia and Tennessee) and thus a Railroad Town was born. Without the rich coal veins throughout the Appalachian mountains, Richmond probably would not have had such rapid growth. Today its population is around the 100,000 mark and although there have been many changes in the railroad over the years it is still a railroad town - not just a historical footnote! The railroad is still a "hub" that holds a thriving downtown area together. Naturally, that brings joy to the hearts of train buffs. Our first trip to Roanoke was for a photo shoot at the Virginia Museum of Transportation. We soon discovered that the city had much more to offer as well. We wound up visiting Roanoke three times in 2017 and each time brought us new experiences. First a Railroad Update: On Oct 31, 2017, passenger service resumed in Roanoke after a 38 year hiatus. Oh Joy! You can now board the train in Roanoke at 6:19am and arrive in Washington D.C. Union Station at 11:20am! It can even return you back to Roanoke by 10pm the same evening. This is going to open up many future business opportunities. You can also go on to New York and Boston. Round trip from Roanoke to Washington DC is $72. That sounds fantastic to us! You can bet that 2018 is going to find us passengers on this train! Roanoke has built a new covered passenger platform and parking lot directly across the street that will make it easy for us to take advantage of another new adventure. We love the fact that the train will drop you in the heart of city and reminds us of the many trips we took in European cities and never needed a car! You can get off the train and head to one of our favorite hotels by foot - the Hotel Roanoke. This grande dame was built by Norfolk and Western Railroad and opened on Christmas Day 1882. The decorations at Christmas time are breath taking and take you back in time! They serve a luxurious breakfast in the dining room that is definitely worth the price and will start off your Roanoke visit in style. There are so many things to do in Roanoke that we will definitely not be able to cover all of them. This city has much to offer from museums, shopping, dining and great views! Hopefully, once you have read our photo blog, you'll make an internet search for the things that appeal to you. We started with the Virginia Museum of Transportation and not only found many wonderful trains to photograph but a wonderful history lesson. For us, the Virginia Creeper Steam Engine No. 6 was of great interest since this railroad not only came through our town, West Jefferson NC, but was the reason our town was founded in 1915. However, there is something for everyone and all ages in the museum. Another favorite of ours is the O. Winston Link Museum. O. Winston Link was a commercial photographer who captured the end of the steam engine era in the 1950s. He mastery of lighting for night shots was amazing for the time. With photographs and audio his collection is a stellar piece of history. The museum is in the restored Norfolk and Western Railroad passenger depot. Also right downtown you can find the Taubman Museum of Art, the Science Museum of Western Virginia and the Roanoke Pinball Museum. The heart of downtown Roanoke is the City Market Building. It covers a city block filled with independent restaurants and retail entrepreneurs. The open-air Farmers Market is the oldest continuously operating market in the Common Wealth of Virginia. It is open 7 days a week all year round! No matter the season it is an amazing experience. Shopping is always a personal experience but there are many wonderful shops in the downtown area as well. You will love being able to walk around seeing the sights as well as being drawn in by the many wonderful window displays. A personal favorite is The Gypsy Palooza. A young designer that is still affordable. Definitely a gypsy style that captivates! Another unique experience is Tink's Place. We were drawn in by the magical window display. Since we have been known as Tink & Pan for a very long time, you can bet we couldn't wait to go inside! Be sure to stop by and tell them the Bluemoonistic Team sent you! Roanoke is definitely a photogenic city and we took every advantage of it. We even found a friendly tourist who took a photo of us at the top of the science museum in the city square! Great place to start or end your tour of the city! A city in the heart of the Blue Ridge Mountains is a true gem!